Once again in 2013 the signs are pointing to the water fight! 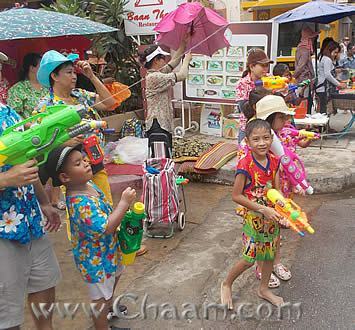 To celebrate Songkran in Cha-Am is completely different than if you celebrate it in tourist hotspots such as Pattaya or Phuket. In this little, romantic fishing village everything is still naturally because Cha-Am is not flooded by Western tourists. This year, the street festival and the carnival floats were so colourful and beautiful as never before! 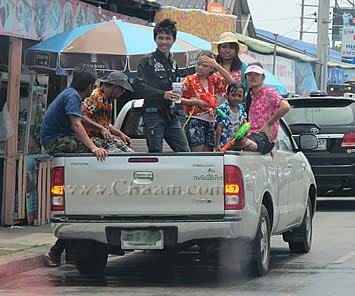 But first of all it was not easy to reach the beach street, because thousands of other people had the same destination. 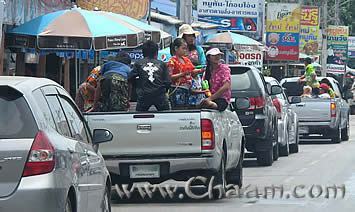 Despite nationwide restrictions many Thais could not be stopped to celebrate and to start the water fights on the Pickup. At some of the Pickups, the loading area was filled with 1000 liters of water and laughing children and adults, and buckets. The people on the loding area overturn the water buckets on other cars and people. Especially popular is, when the water is cooled by ice cubes below 10 degrees Celsius ... Because then you can see a shocking-frosted face of the victim, which stimulates the general cheerfulness! Many police man and traffic police were in the roads to ensure a smooth running of the traffic. With good success, because all car drivers were driving slowy and not agressive. We did not see one single accident in the day. 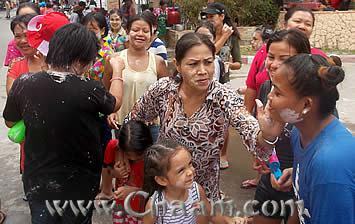 Besides playing with the water it is tradition that Thais put white or coloured powder in your face. The disadvantage is, when you get soaked, then the powder is rinsing deeper and deeper and later you find it everywhere and in every body opening! Water fighting makes hungry! 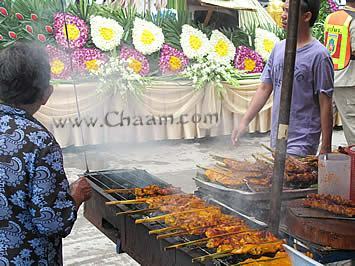 In the beach road you find a lot of food stalls, who were selling fresh chicken or fish. 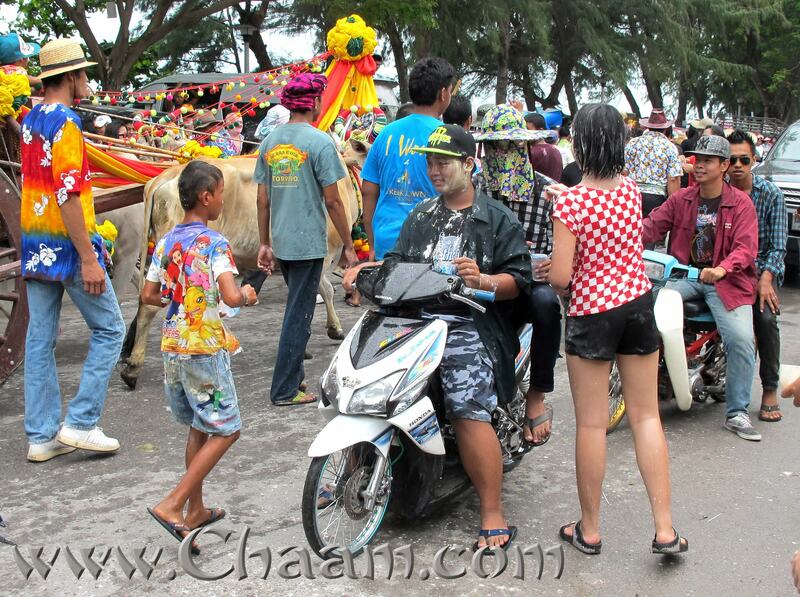 The Songkran festival 2013 in Cha-Am was a very peaceful event. 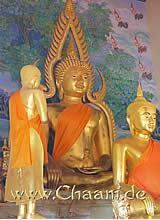 When we remember at last year, we saw already at midday many drunken young Thai people on motor bikes. But this year everything was more civilized, more nice. When the carnival floats were passing the road, the big party started. Everybody was laughing or smiling and having fun to spray with water. 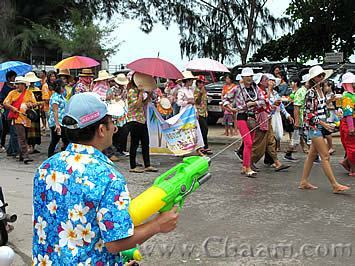 However, every year to Songkran ALL hotel rooms and guest houses are fully booked. If you still find a room right at Songkran, you have to expect to pay 3 to 5 times of the normal price. 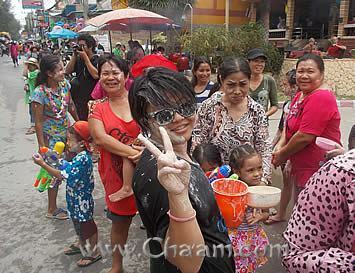 To celebrate Songkran in Cha-Am is very popular for many Thai people, especially the Bangkok people. They come to tens of thousands, streaming in from all directions.